It’s Time for Sales Management to Evolve. Here’s How! Digital transformation of the selling process has affected the job of managing the sales process, as well as the primary activities of sales reps. Sales management has a kind of opened-ended job description. Sales managers mentor, train and coach sales reps. They also manage the sales process in terms of hiring and firing, territory assignments and quota performance, while overseeing the sales operation from an administrative position. “Sales manager” is a complex and challenging job that is difficult to fill. The individuals who possess all of the skills, talents and personality traits required to be effective are, indeed, quite rare. Digital transformation has come to the doorstep of the sales manager’s office, and that is a good thing. Sales managers will find significant benefit in numerous areas of their job, thanks to the proliferation of digitally empowered applications and technology. Let’s look at several areas that offer great examples of how this works. On-boarding new sales reps used to mean you were hiring someone who knew how to sell, but likely did not know how to sell the particular product in your inventory. The individual had skills, but no product knowledge. Newly hired sales reps frequently were sent to “product school” shortly after hiring to learn all the facts, specifications and other minutiae about your product line. Learning to sell the actual product frequently meant going on calls with senior reps or participating in extensive role-playing exercises to get the salesperson used to speaking the language related to the product and understanding the value proposition offered. These product schools might involve weeks or even months of down time, while the sales rep gained familiarity with the product and market being served. CPQ technology has eliminated the need for much of this product training by building scripted, interactive interviewing processes into the engagement model. 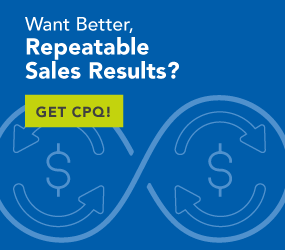 Instead of relying on the rep to think of all the necessary questions to ask a prospect, CPQ poses guided-selling questions, which can be articulated by the sales rep and answered by the customer. As answers are provided, additional questions are asked, and specific options are offered or disqualified. The sales rep learns about the product throughout this process. The underlying message is articulated through the interviewing process, as well. The language and content of the specific questions ensure the product value proposition is represented by the actual problems and pains addressed within the context of the interview. The need for rote memorisation of SKUs, product pricing and other information is eliminated. New hires become productive almost immediately. They do not need to learn to parrot assorted phrases or vocabulary because the guided interview does that for them. Marketing should understand which markets are going to respond to specific products. The CRM systems used today can fully define a target market by vertical segment, contact roles or job title, annual revenue, geographical locations or many other criteria. Together, Marketing and Sales management should be able to isolate specific types of contacts at specific companies most likely to respond to offers generated in a sales campaign. The CRM system is the repository of call-related information, so the campaign can be tracked from start to finish. This keeps sales focused on high potential opportunities and helps to eliminate science project engagements that don’t really fit the profile defining a successful user of the product being sold. Again, by sticking with the CPQ interview process and the guided selling logic driving the interview, the rep is going to find success within the campaign designed by sales management. Within CPQ is a quotation-and-proposal-management system. This automates much of the work required to produce a professional grade proposal, complete with cover letters, user stories, product and solution collateral and other supporting documentation. Sales managers, for years, have agonised over their sales force spending days in the office assembling materials for presentation during a proposal. Their major producers are essentially spending their most valuable time getting ready for a sales presentation or major proposal. Office admins and junior sales associates are often drafted into this process, as well, making it even more expensive. All of the while, the sales manager is fretting about not getting the big deal and posting a goose egg for new engagements and new contacts during this process of building the proposal. CPQ technology is one way this whole scenario goes away. Within CPQ is a quotation-and-proposal-management system. This automates much of the work required to produce a professional grade proposal, complete with cover letters, user stories, product and solution collateral and other supporting documentation. For simple quotations, CPQ produces time- and date-stamped pricing for itemised product lists. The whole process of quoting and proposing is automated. Sales teams can review what has been generated and make corrections and edits as needed. But, they don’t have to spend days out of the field doing clerical work. All of this automation and digitisation of labour-intensive processes delivers to sales management a number of benefits. Perhaps, chief among these is the ability to contribute to the enterprise at a whole new level. Too many sales operations have been siloed and kept apart from the rank-and-file operation of the company. That is unfortunate. Sales needs to provide meaningful and reliable input into all manner of corporate decision-making processes. These would include things like product development, market definition, voice of the customer discussions and performance improvement plans. The newly technologically empowered sales operation frees sales management from much of the operational load associated with hands-on training, marketing and campaign development and prospect engagement. Sales management now has the time and information to provide meaningful contributions to the management of the enterprise.